In his latest interview for Western media, this time for the US-government sponsored Voice of America, Ukrainian President Petro Poroshenko offered a series of provocative, factually dubious and outright silly responses to some very important questions. Sputnik took the liberty of compiling them. In the interview, published Friday, Poroshenko talked about "Russian aggression" against his country, about the fantastical successes his government has apparently had in combatting corruption, about Ukrainians' supposed support for their country's integration into NATO, and about the need to strip Russia of its veto power in the United Nations Security Council. The president, who came to power in dubious elections following a coup d'état against his unpopular but democratically elected predecessor, spoke about how his country continues to resist "Russian aggression," and that it is "fighting here not only for our independence, but for freedom and democracy." Poroshenko again blamed Moscow for the crisis and civil war which engulfed eastern Ukraine in the aftermath of Maidan, when the Ukrainian military launched its 'antiterrorist operation' against independence and autonomy supporters in Donbass, declaring that Ukraine's military is successfully "stopping the biggest military machine on the continent," referring to the Russian army. Since last summer, Poroshenko has repeatedly spoken about an outright "invasion" of eastern Ukraine by thousands of Russian regular troops. This past summer, the president boldly asserted that up to 200,000 Russian troops had been amassed inside Donbass, with Russian media subsequently having a field day refuting the president's assertions. RT noted that "if Poroshenko's claims are true, the forces would have to possess incredible stealth capabilities, as no surveillance or intelligence service has detected the numerous troops crossing the border, [nor] have the OSCE observers stationed at the border." Whether the claims are of 9,000, 50,000 or 200,000 Russian troops operating in Ukraine's east, the Russian side's response to the ever-more fantastical allegations made by Kiev, Washington and NATO officials has always been simple, asking the other side to provide elementary proof of the Russian military presence. In the VOA interview, the president went on to say that Russia's actions against his country have "ruined the post-war global security system; it is not working anymore." He called on the world to show "solidarity with Ukraine," noting that "they should trust us," and adding that America's "trust for us now is very important." Asked by his interviewer why the world community should trust Ukraine and its leadership, the president explained that it has everything to do with his government's "tremendous successes" over the past year. 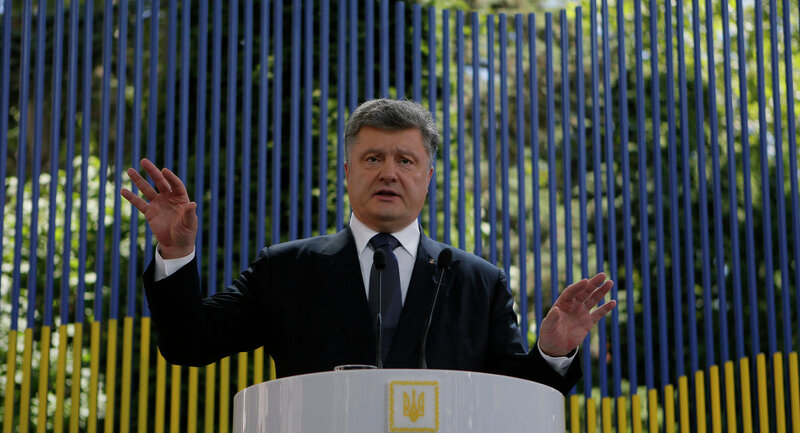 Poroshenko stressed that in the nine months which have passed since the formation of a new coalition in the country's parliament, "we have built a new army –we are defending our country. We are stopping the biggest military machine on the continent. We have launched a huge reform effort, in cooperation with the International Monetary Fund; we have delivered a very strong report about its implementation. In a situation of war we have [managed to] cut the budget deficit; we have made the state machine more effective." With his country facing one sorry corruption scandal after another, from the discovery that $1.8 billion in IMF bailout funds had disappeared, winding up in a Cyprus bank account belonging to notorious Dnipropetrovsk oligarch Ihor Kolomoyskyi, to a report by the head of the European Business Association in Ukraine noting that the president was involved in the sale of seats to the country's parliament, Poroshenko told his interviewer that the country's anti-corruption efforts have actually been a success. "We have established an absolutely enormous program of anti-corruption measures –launching the anti-corruption bureau, creating a new police force, launching a new prosecutor's office…launching programs of court reform, and this is not an easy job, to make reforms during the war, believe me," Poroshenko boasted. Arguably the most spectacular claim made by the president during his interview with VOA was his assertion that now, "for the first time in our history, more than 50 percent of Ukrainians support NATO membership." 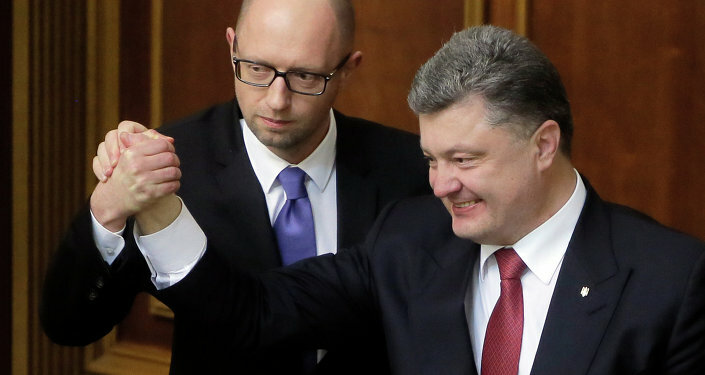 Poroshenko made the remark about this "huge shift in public opinion" as part of his commentary on the Ukrainian National Security Council's release of a new, revised military doctrine, ready for the president's signature, which declared Russia to be Ukraine's 'main military adversary', and called on Kiev to pursue NATO membership. It is unclear where exactly Poroshenko got his figures, but a widely publicized poll published last week by independent sociological research firm Rating Group confirmed that despite the incessant beating of the war drums by much of Ukraine's media, only 41 percent of Ukrainians said that they would vote to join NATO if a referendum were held, with 30 percent declaring that they would vote against it, 14 percent saying that they simply wouldn't vote, and 15 percent answering that they were uncertain. Declaring that public opinion was on his side, Poroshenko stressed that "we will not ask permission for reforming my country. To meet NATO criteria is absolutely the same as meeting EU membership criteria. They are 98 percent alike." The president added that "NATO is now the most effective security mechanism in the world, after the global, UN Security Council mechanism was ruined" (by Russia, naturally). At the same time, Poroshenko noted that he "fully understands" that NATO's members would be unlikely to accept Ukraine in its present state, admitting that the country "doesn't meet the criteria." However, the president seems to believe that as far as his international partners are concerned, the alliance made themselves clear "in 2008, during NATO's Bucharest Summit, [stating that] NATO's door is open for Ukraine," provided that the necessary reforms are made. Asked about his country's failed efforts to help to instigate a UN tribunal over the downing of Malaysia Airlines Flight MH17, Poroshenko explained that an "aggressor against my country –Russia," is vetoing the resolution. Asked what this means about the future of Russia's role in the Security Council, the president graciously explained that while Russia "can stay" within the organization, "I think their veto right should be lifted." In his words, this would not only "make the mechanism of the Security Council more effective," but would "return effectiveness to the mechanism, which is now simply blocked. We do not have any alternative to this." Needless to say, the president seems to have forgotten that in the aftermath of the Second World War, when the United Nations was being formed, the very existence of the organization hinged on the veto rights of its permanent members. This right, provided for under Article 27 of the UN Charter, has been credited with serving to ensure global stability over many decades, and with the prevention of the casual launching of UN-sanctioned crusades on smaller countries by the world's most powerful states.